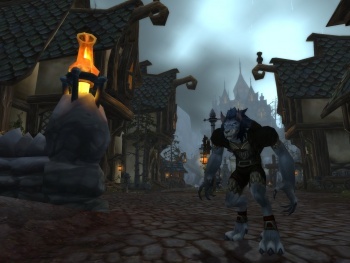 If you're a developer looking to get a piece of the MMORPG pie, trying to follow in World of Warcraft's footsteps is "definitely not the right move," says Blizzard lead producer Shane Dabiri. "There are a lot of people that try to emulate World of Warcraft - and as flattering as that is our end it's definitely not the right move," said Dabiri. "I know that World of Warcraft is very successful, and so people think if they were to make another game just like it they could somehow capture that audience. However, I don't think that's what players are looking for ... Players that have invested time in WoW don't just want to do the same thing in other game - they want to try something completely new and different." Instead of trying to just ape WoW, Dabiri suggested that developers should just try to find something new that works for them. "I think the industry needs to move in that direction to come up with some innovative new MMOs that are trying really different things. Take City of Heroes - at least that's something that's not a fantasy game." While I'm not sure that City of Heroes is the best example Dabiri could have used (considering that it came out before Blizzard's behemoth), it's hard to say that the man doesn't have a point. I'd be willing to bet that more people would rather play WoW then a game that tries to be WoW - there's only so much swords-and-sorcery that a guy can take. Games like Global Agenda and APB are (hopefully) good examples of MMOGs trying something new, and of course there's always the seminally odd EVE Online. On the other hand, one could argue that WoW's refinements to the genre as far as accessibility is concerned are almost requisites for a new MMOG these days. To be fair, though, it's possible to make a pick-up-and-play game that doesn't require that people devote their lives to it in order to advance while still trying something new and relatively original. The logic of Dabiri's statement is kind of a "duh" no-brainer, but it's nice to see someone actually getting out and saying it on the record for once.